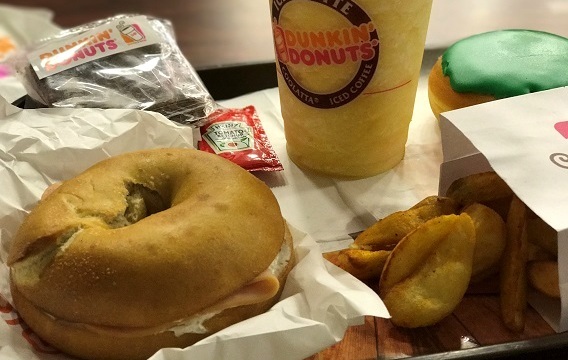 Back in 2015, Egypt went crazy when American chain, Dunkin’ Donuts, opened its first branch – but thing got weird fast. It received a whole load of terrible reviews, there was some social media furore about rotten bagels and then there was a controversial post that rubbed up people the wrong way, with the chain accused of racism. Despite this, there are now ten or so branches – are we missing something? At the time of our visit, one of the newest branches, located in Dokki’s El Messaha Square, was surprisingly very crowded. The venue itself is quite small and the tables were far too close to each other which made it a bit uncomfortable. There was also a tiny outdoor area with few tables that feel less claustrophobic. 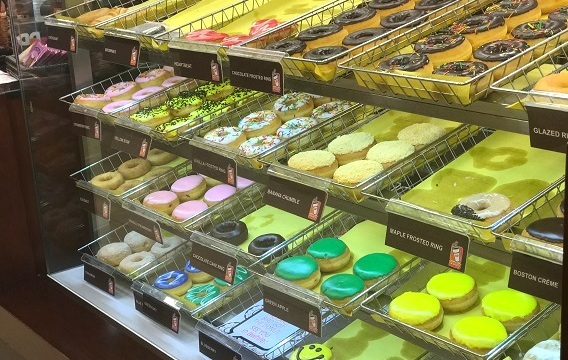 After looking at what was a very colourful and cheerful display, we opted for a Cream Cheese Bagel (23LE), Potato Wedges (13LE), two Donuts (15LE each), a Brownie Caramel (20LE), and a Passion Fruit Coolat large (47LE/large). The bagel was too dense and slightly dry, and the result was an unpleasantly chewy texture. It was filled with a generous amount of store-bought cream cheese and the cashier recommended adding an extra slice of turkey (7LE), which was bland in taste and, like the other fillings, was well overpriced for what it was. It would be a lot cheaper – and better – to build your own bagel at home. The wedges were also slightly undercooked and lacked seasoning. As for the donuts, the Boston Cream was filled with a very bland custard, but topped with a chocolate glaze which had a great texture. The Green Apple donut, meanwhile, was stuffed with a delicious cinnamon apple filling, but topped with tasteless green glaze which had a strong food colouring flavour. The dough itself was light and puffy, but there was just an unpleasant artificial aftertaste to it. Meanwhile, the pre-packed caramel brownies, which didn’t have any caramel at all, had a very wet and soggy layer, though the rest of it was rather dry, overly sweet and clearly not fresh. The only thing that didn’t disappoint was the passion fruit smoothie, which was refreshing chilled, had a great consistency and full of sweet passion fruit syrup. And so in the end, we still couldn’t solve the mystery of why Dunkin’ Donuts has so many branches, because our experience was a letdown, to put it lightly. There were so many flaws in our order, so many artificial flavours and the venue itself is very uncomfortable. We always try to look for a bright side, but this one was particularly difficult. It’s not a bad spot for a quick meeting – so there’s that. Visit www.talktodunkinegypt.com and enter the survey number on your receipt to tell them about your visit and get a free small original blend coffee. Yay. The smoothie was delicious- perfect for the summer. Where do we start? All the food items were simply bad.